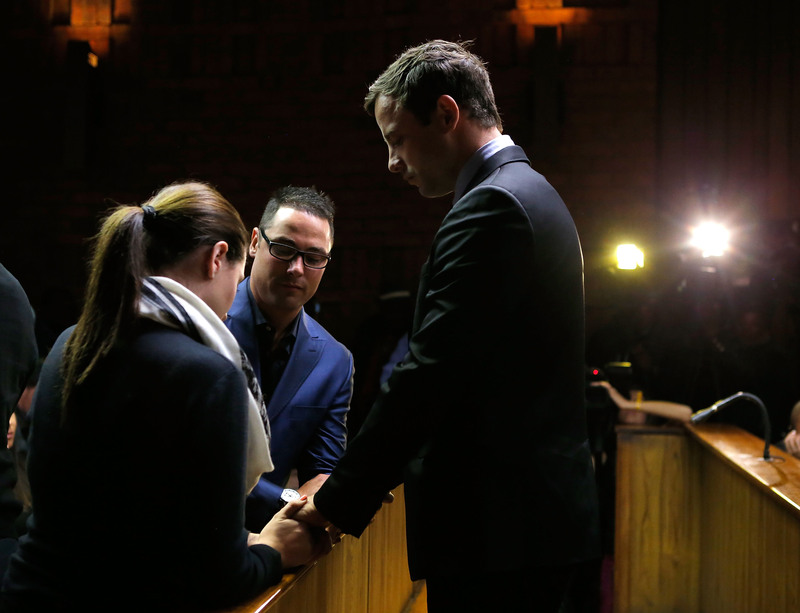 On Friday, the tense, widely-watched Oscar Pistorius trial came to a close: Judge Masipa found the Blade Runner guilty of culpable homicide and discharging a firearm in public, meaning the athlete managed to avoid a lifetime in prison. This doesn't imply it's all over, though. With the sentencing set for mid-October, the question remains: just how long will Pistorius be in jail? With a culpable homicide conviction, the ball's in Judge Masipa's court. On October 13th, she can choose to hand Pistorius pretty much whatever punitive measure she feels like — so long as it doesn't exceed 15 years in jail. Since culpable homicide carries no prescribed or minimum sentence, Judge Masipa could technically let the Blade Runner go free, with just a warning or a fine (usually the penalty for car crashes). He could also be given a suspended sentence, meaning he might have to report to parole officers. Essentially, in both cases, he could go back to his life, and even his career as an Olympian. Considering the high-profile nature of the case — and how enraged everyone is by this lesser charge already — this outcome is unlikely. According to the South African Centre for the Study of Violence and Reconciliation, correctional supervision is also a sentencing option. This is slightly different from parole, in that it doesn't necessarily require some initial jail time; Pistorius could be immediately sent out to serve correctional supervision. What this might mean in actuality can vary — he could be under house arrest for a while, or partial house arrest, or community service. In all cases, he'd be closely monitored by the Department of Correctional Services until the end of his sentence. His community might not be all that friendly, though. This is perhaps the most likely option. Here, Judge Masipa would give the Olympian some prison time, but it would be relatively minimal. According to the director of Johannesburg-based BDK Attorneys, quoted by Bloomberg: “Probably you’re looking at three to four years, but it’s very difficult to predict as one will have to wait to see what arguments both sides come up with." According to the AP, the general guideline for culpable homicide — when someone's used a gun — is five years. Alternatively, he could get a suspended sentence on the culpable homicide charge, but still get five years for the firearm charge. This probably won't happen, but you never know — Judge Masipa might feel as though, because she acquitted Pistorius of murder, the athlete should not be let off easy. She might give him the 10 years, and the whole five years for the firearm conviction, and he could end up in one of South Africa's worst jails — the dreaded C-Max jail. Clearly, the worst-case scenario for the athlete. If Judge Masipa finds Pistorius was " grossly negligent," she could slap him with 15 years for culpable murder and five years for discharging a firearm — the next two decades would be spent behind bars (although in all likelihood, with a strong chance of parole). There's a very small chance this will happen, but who knows? It's all up to the judge.